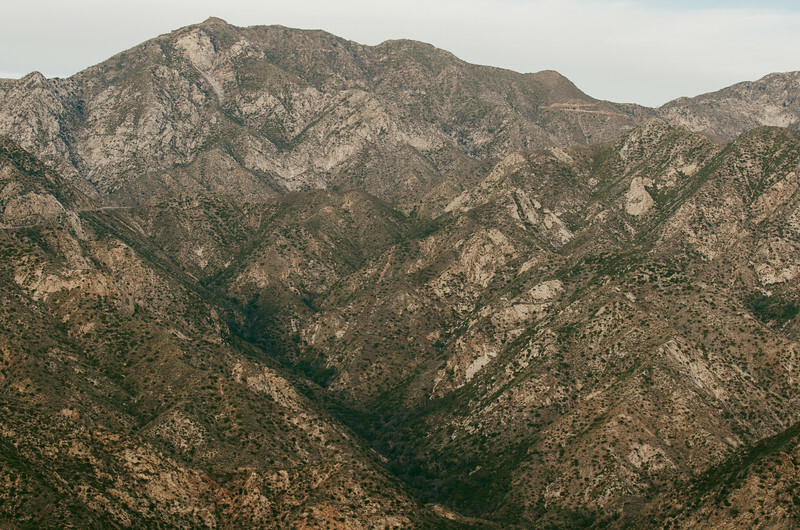 The San Gabriel Mountain front range. Looks better larger. Click here. 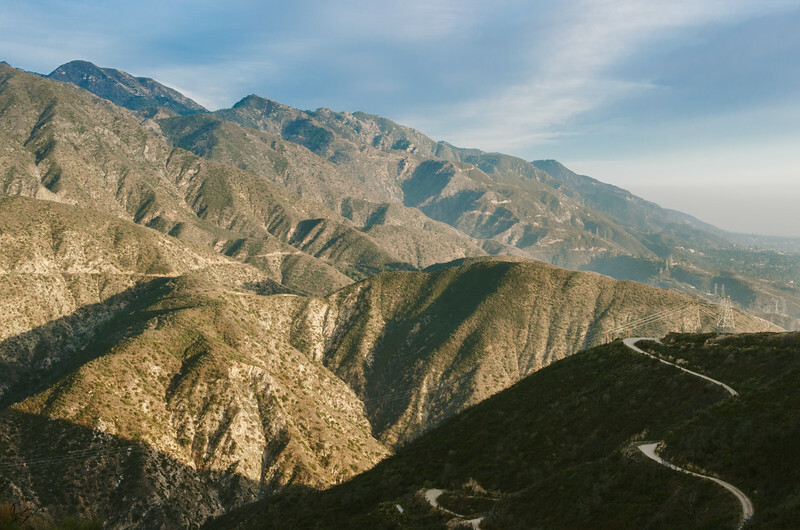 That's the Angeles Crest Highway slicing across the left side of the image. A reminder of the Station Fire that started in this area in 2009 and chewed through tens of thousands of acres in the Angeles National Forest. Good idea for a composition, but two problems: too much shadow in the lower right and too much haze in the upper right. This is a photo that needs to be shot a little earlier in the day and on a clearer day. That's the way it goes sometimes -- you're just scouting for ideas for the next trip. A closer view of the upper Arroyo Seco. 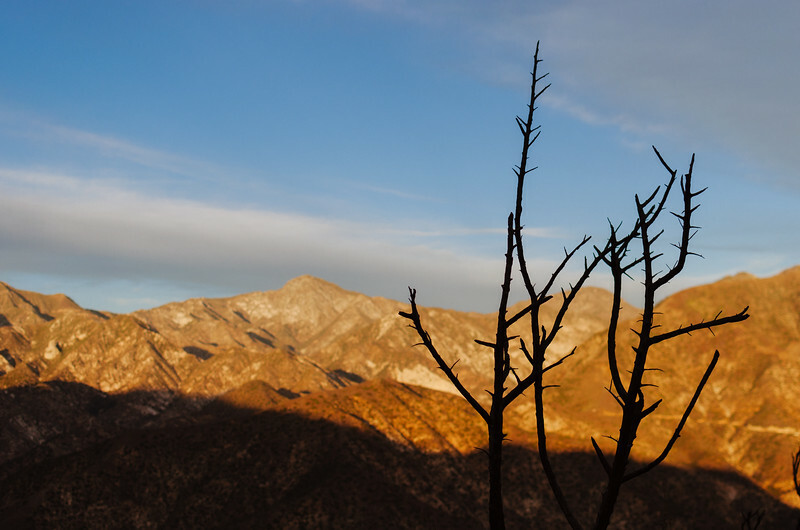 All the photos were taken last Sunday on a hike in the San Gabriel front range that looms over the Los Angeles area. As you can see, I tried some different types of processing -- just seeing what might work. The first shot is arguably the strongest but it's also an eyeful. The photo lacks any one particular subject; the subject is the ruggedness of the mountains. My eye tends to wander across the image looking for something to focus on -- that's a weakness. The strength is that it's a great view of the front range and there is a lot of detail for those interested in topography, geology and geomorphology.